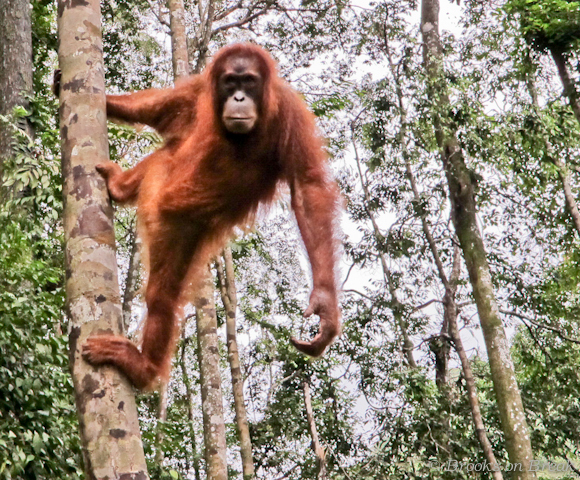 We heard rustling in the trees above and as we looked up to find its source, an Orangutan come crashing down right in front of us stopping just short of the jungle floor. We scurried down the hill to give the Orang his space, but he’d split our party in two. One of our guides, Herman, had been trailing a bit behind us and was now cut off from the group. The Orang, a ten year-old semi-wild male, was intently focused on Herman, staring him down and refusing to let him pass and rejoin our group. Since he was just a few meters away, we sat and watched him for a while before heading further down the embankment towards the river. 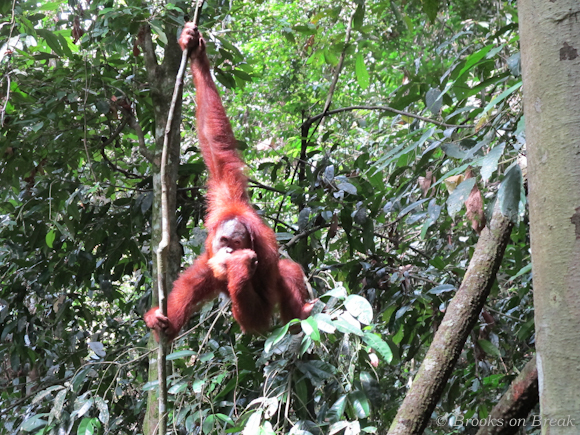 Every time we would move, the Orang would climb a little way back up in the trees and swing along, mirroring our movement, but every time Herman would try and pass underneath to rejoin us, the Orang would drop down and cut him off. He was playing keep away and clearly enjoying it. At no point did we feel threatened, instead we actually laughed and joked about the Orang having a crush on Herman. This back and forth continued for about 30 minutes, but subsided as we got to and crossed the river. Orangs don’t like water because it’s very tough for them to dry out – a wet Orangutan means parasites and sickness and they’re acutely aware of this. If you’re lucky this is the kind of experience you’ll have when visiting Bukit Lawang Orangutan Sanctuary in Northern Sumatra in Indonesia. Bukit Lawang is the main entry point for the Gunung Leuser National Park and is the largest sanctuary for the Sumatran Orangutan with approximately 5000 Orangutans living in the area. The Orangutan rehabilitation center opened almost 40 years ago and exists to preserve the Orangutan population from hunting and an ever-shrinking habitat due to deforestation. Bukit Lawang is 86 km away from Medan, Sumatra’s biggest city and is relatively easy to get to, as there’s only one road in and out. Public bus is the cheapest way, with a direct one-way bus fare on a non air-conditioned bus from Medan’s Pinang Baris Bus Terminal running around 10,000 rupiah ($1 USD). Buses leave about every half hour and figure about six hours for the trip. It can be a little more expensive traveling back to Medan as you’ll be captive going in the other direction, but you shouldn’t pay more than 12,000 rupiah ($1.25USD). There are also private drivers offering minivans from the bus terminal as well as the Belawan ferry terminal, but you’ll need to bargain hard to get a good price. Depending on the minibus, you should expect to be transferred at least once (in Medan) along the route and prices should be around 60,000 to 70,000 rupiah ($6-$7 USD). Since I arrived late at night and needed to meet my traveling companions, I opted for a private car as the guidebooks, and some friends, told me the public buses stop running at 6pm. A private car from the airport in Medan cost me 400,000 rupiah ($44USD), which was a fixed, non-negotiable rate. While certainly not the cheapest way, it was comfortable and quick and a good late-night option taking only 3.5 hours for the long and bumpy route. When you get to Bukit Lawang, a jungle trek is the best way to see the Orangs in their native habitat, but it’s illegal to go unaccompanied into the jungle. There are tons of guides in Bukit Lawang and the minute you step on to a bus, minibus or taxi, you’ll be asked (repeatedly) if you want a guide. All guides have to be licensed, but there’s no training/education or accreditation system, so take the time to speak with a potential guide and make sure they’re knowledgeable, educated, and responsible. 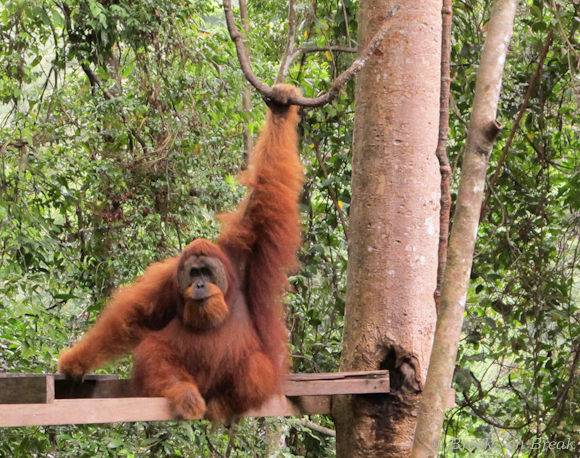 I would recommend doing your trek with one of the official rangers from the Orangutan Rehabilitation Centre. They’re much better trained than other guides and they take the protection of the Orangs, and the environment, much more seriously. Some guides feed the Orangs with food during a trek just to coax the animals down for the tourist, which can be very dangerous for the Orangs as they can get sick from the food or more seriously be lured by poachers in the same way. Specifically for a guide, I would highly recommend Darma Pinem – darmapinem [at] gmail.com – (www.bukitlawangadventure.com) and his assistant, Herman, to anyone seeking a guide. Darma works both as a ranger and a guide, is very well educated about both the Orangs and everything else you’ll encounter on a trek, speaks great English, and was as enthusiastic about finding the Orangs as we were. He is also passionate about protecting the area and more than once we saw him cleaning up after other, less diligent guides who had left litter or food scraps on the forest floor. 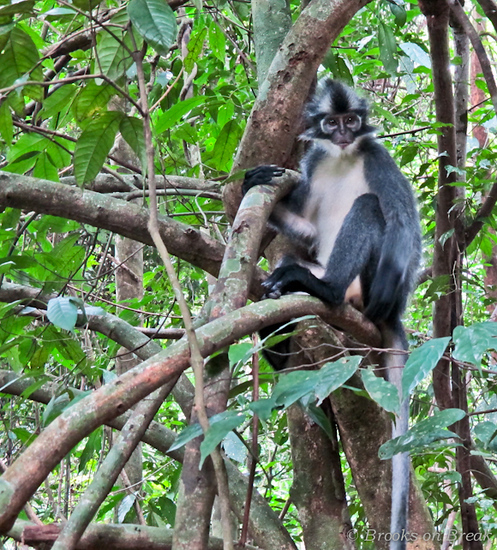 No matter the guide, Jungle treks have a fixed price of €25 ($35USD) per person per day. There are single day and multiple day treks available with food and any necessary camping gear usually provided by your guide, but check ahead of time to be sure. Most guides will insist on a minimum of three people for a trek, but it’s easy to find people to join in town and some guides will even go with two people. Be aware that a jungle trek can be challenging. The humidity coupled with the up and down terrain of the jungle does make for some hard work and you’ll sweat like never before, but it’s all worth the effort once you come across an Orangutan. 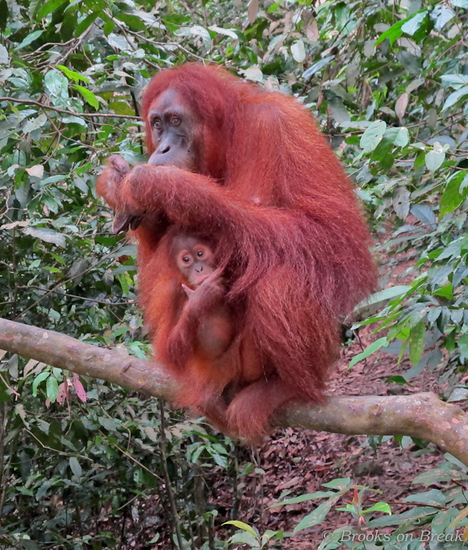 If you’re not interested or able to do a jungle trek, it’s still possible to see the Orangutans at the feeding station. Once in the morning and again in the afternoon, the rehabilitation center makes food available to the Orangutans at a feeding platform. Our guide decided to start and end our trek there and each time we saw multiple Orangutans and even a few mothers with their babies. The feeding platform is near the sanctuary entrance and is easily accessible up a few flights of stairs and a few hundred-meter hike into the jungle. There a couple of other Orangutan sancturaries in Indonesia and Borneo’s, most famously at Borneo’s Sepilok Orangutan Sanctuary and at Indonesia’s Tanjung Puting National Park. 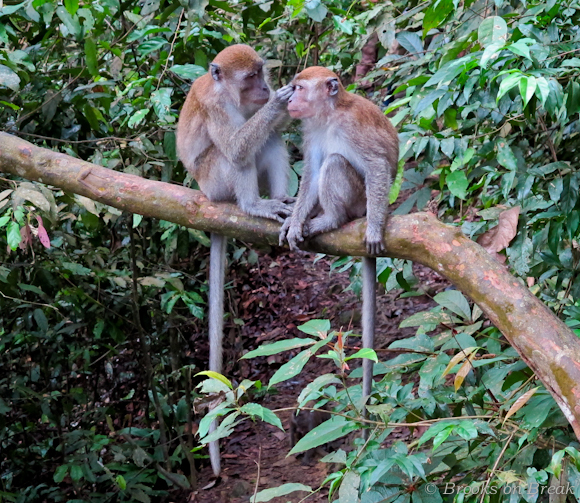 Sepilok is perhaps the easiest of the sancturaries to reach, a few miles outside the city of Sandakan. Tanjung Puting is in the wilds of Kalimantan (the area of Borneo that belongs to Indonesia) and so not so accessible. Start Planning Your Indonesia Trip Now! :: Find the cheapest flights to Indonesia with Skyscanner - one search will show you the prices and times from scores of airlines for your trip. A real timesaver. :: Get travel insurance for Indonesia from World Nomads - make sure you're covered to protect both your health and your belongings. World Nomads lets you buy insurance online quickly and easily. :: Explore our Indonesia Travel Guide for more Indonesia must-see destinations.